Call us for questions, requests, or some pleasant military chatter. Uncle Sam’s custom dog tags make a great gift for more than the casual military enthusiast. Our dog tags are perfect for any occasion or any object, from birthdays to luggage, and soldiers of all size are guaranteed to love them. Here at Uncle Sam’s, we offer competitive trade-in prices for any old military garb or outdoor gear you may have cluttering up your home. We have a huge selection of products from brands that you trust. More than that, many of our brands are used by professional organizations like the U.S. Military. "I travel around the country a lot and the Army Navy stores are my favorite to find. 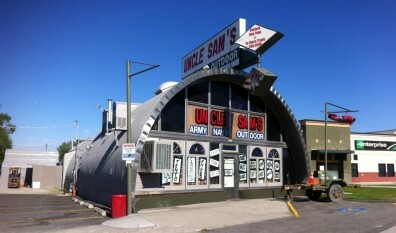 I was so excited to see the variety that Uncle Sams in Orem has. I found the Mucklucks that I had been looking for forever! The best part is that they were priced really reasonably. I really dig this store and the employees went out of their way to find things for me. - Review on Google from Bill"